The 3-inch Cadillac to Katahdin Holiday Ornament is strung on a 4-inch red satin ribbon with gold metallic trim. Available only through Acadia on My Mind Shop. From autographed copies of our Acadia hiking books, to a Cadillac to Katahdin Holiday Ornament modeled on the Cadillac to Katahdin Virtual Run medallion, products from our online shop help raise funds for Friends of Acadia, Our Katahdin or Millinocket Memorial Library. SHIPPING: Free US Priority Mail shipping. Order by 8 a.m. EST on Dec. 20 for delivery by Christmas. SHIPPING: Free shipping if spend $50. Order by 9 a.m. PST on Dec. 20 for delivery by Christmas. 20% off bandanas and scarves, including such Acadia gift ideas as a bandana with coastline photos, and a scarf featuring a map. SHIPPING: Free shipping if spend $35. Usually takes 5 to 10 business days, but expedited shipping at extra cost possible by calling 877-NAT-PARK. We’ve had fun turning some of our Acadia photos into coloring pages using the ReallyColor, LLC technology, see below. SHIPPING: E-mailed gift certificate. No shipping cost or delay. “Hiking Acadia National Park” won the 2016 National Outdoor Book Award in the outdoor adventure guide category. Hiking Acadia National Park – The 3rd edition of our guide came out last year, and won the National Outdoor Book Award. It features a description of the new Schoodic Woods hiking trails, although not in as great detail as other hikes, since they were officially made part of the park as the book was going to press. You can also buy a full-priced autographed copy directly from us, with at least 5% of gross proceeds being donated to help the park. Best Easy Day Hikes Acadia National Park – The 3rd edition of this pocket-sized guide that we wrote for Falcon came out in April 2015, and features a couple of the newest trails in the park, the Quarry and Otter Cove Trails, as well as the classic easy hikes as Ocean Path and Ship Harbor Trail. It’s small enough to stuff inside a stocking, too. You can also purchase a full-priced autographed copy directly from us, with at least 5% of gross proceeds being donated to help the park. Treasured Lands: A Photographic Odyssey Through America’s National Parks – Noted photographer QT Luong, featured in Ken Burns’s and Dayton Duncan’s PBS series on national parks, won numerous awards in 2016 for this large-format 456-page book. You can buy autographed copies directly from the author at full price. This substantial book includes a chapter on Acadia National Park, featuring not only some of his spectacular photos of the park, but also some tips on visiting, and notes about how and where he took the photos included in the book. It includes a foreword by Duncan. Katahdin – Amazon.com search results include hiking guides and maps, histories and even an art book. SHIPPING: Free standard shipping if order by Dec. 18; Prime free 2-day shipping if order by Dec. 22; Prime free 1-day shipping in select areas if order by Dec. 23; Prime free same-day shipping in select areas if order by 9:30 a.m. local time Dec. 24. Minimum order requirements may apply. A tribute gift to Friends of Acadia or Schoodic Institute at Acadia National Park – Not limited to the holidays, such a gift can commemorate a birthday, anniversary or any other special occasion. Such a gift to the Friends of Acadia would be recognized in the Friends of Acadia Journal. Or perhaps you might want to make a gift to the Schoodic Institute, which provides environmental research and education and such citizen science programs as HawkWatch, can notify the person you’re honoring with the gift. Millinocket Memorial Library or Our Katahdin – These 2 Millinocket nonprofits were among the beneficiaries of the Millinocket Marathon & Half and the Cadillac to Katahdin Virtual Run. National Parks Traveler is a prime place to turn. Among some of the stories currently on the home page you’d be hard pressed to find anywhere else: A photo essay of national parks in winter, including Acadia; a story on a Department of the Interior survey on harrassment in the workplace; and a report on a US House bill to open wilderness areas to mountain bikes and other wheeled vehicles. Faced with the same challenges as other news organizations in this day and age of the Internet and social media, National Parks Traveler became a 501(c)(3) nonprofit this year, making it eligible to receive tax-deductible donations. There’s even an Acadia donor level, at $50, and a place to provide special instructions while making the donation, perhaps if you’d like to honor a family member or friend. Last-minute holiday shopping for Katahdin and Acadia gift ideas doesn’t have to be stressful, or boring, when you’ve got this gift guide to help. Happy holidays from Acadia on My Mind! 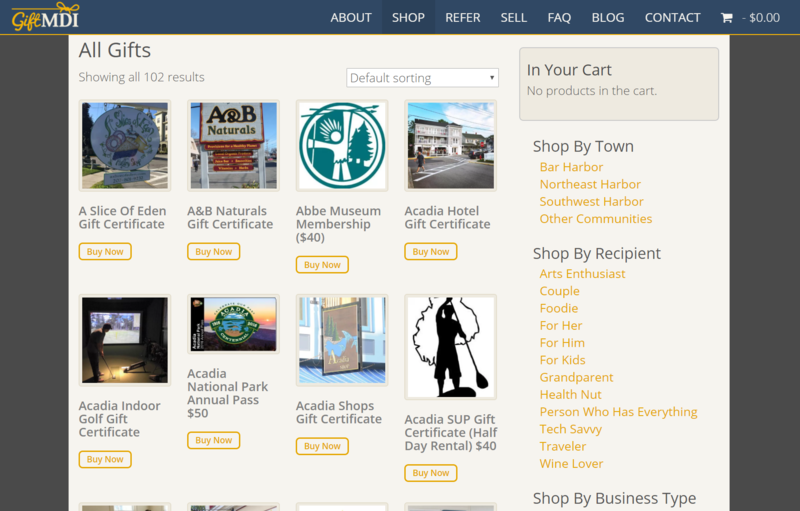 Below are screenshots of all the gift certificates available as of this writing on Gift MDI, images courtesy of Gift MDI. Keep checking back on the Web site for new additions. For mail delivery of physical gift certificates in time for Christmas, order online no later than Dec. 17. Purchase of e-mailed Gift MDI certificates can be made as late as Dec. 23, which can then be redeemed for use at more than 100 local merchants or organizations. See Web site for FAQs.